Two past titans of the Alpari World Match Racing Tour came head to head on Bermuda’s Hamilton Harbour in today’s final of the 2013 Argo Group Gold Cup. The assembled spectators watching from the Royal Bermuda Yacht Club and the massive fleet of craft parked by the race course were treated to a display of match racing at its best when the Luna Rossa crew, led by Francesco Bruni (2nd on the Alpari World Match Racing Tour in 2011) and Ben Ainslie’s Argo Group-backed crew (1st in 2010) lined up in one of the most tense Finals seen on the Tour this year. Then, with social media awash with suggestions of another Ben Ainslie come-from-behind victory following Oracle Team USA’s in the 34th America’s Cup, came the decider. In this the British crew set up to leeward off the line but this allowed Bruni to sail Ainslie into the light winds off the harbour wall. As the two boats tacked Bruni was ahead and sailing faster. From here Ainslie was unable to counter and for the first time in the Argo Group Gold Cup’s 76 year history, it had an Italian winner. This event marks Bruni’s return to the Alpari World Match Racing Tour after a break to compete in the 34th America’s Cup as tactician on the Italian challenger’s AC72. “I am so happy,” he continued, with a big grin. “I wasn’t expecting it to go so well. I have to thank Luna Rossa for giving me the opportunity to come here and the guys who came here with me did a great job.” His crew who all sailed on the Luna Rossa AC72, comprised Spanish 49er Olympic gold medallist Xabi Fernandez, Britain’s Nick Hutton and Italian Pierluigi de Felice. 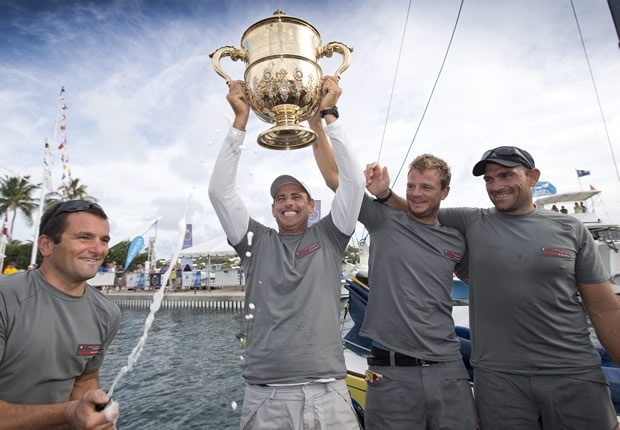 The US$20,000 Ainslie’s team wins for their second place finish (Bruni’s team goes home with US$50,000) will be donated to the Andrew Simpson Sailing Foundation, which Ainslie and Iain Percy have been publicising this week and the reason they have been competing at the Argo Group Gold Cup. The money will go towards helping provide underprivileged children with the opportunity to get out on the water. Following yesterday’s dire conditions, conditions today were much improved, allowing for the Semi Final races to be concluded. In these, Francesco Bruni’s team won his two races against Taylor Canfield’s USOne to claim his Semi-Final 3-0, while Ainslie demolished Adam Minoprio’s Team Alpari FX with the same scoreline. Then lining up against young US Virgin skipper, Minoprio again failed to find his form, slow out of the start and then unable to get back in contention, then losing his lead to Canfield’s team in the second. Taylor Canfield felt a few umpire calls, particularly in the last race, had gone against him but conceded that the Italian crew had done a better job of taking advantage his team’s flaws and mistakes. With Ian Williams’ GAC Pindar team being knocked out in the Quarter Finals round, there has been a change of leader in the Alpari World Match Racing Tour with one discard counted prior to November’s Monsoon Cup. Moving into first place with a 10 point lead is Taylor Canfield and his USone team, but it remains close for the podium positions with Williams in second just one point ahead of Bjorn Hansen’s eWork Sailing Team, in turn four points ahead of Adam Minoprio’s Team Alpari FX.